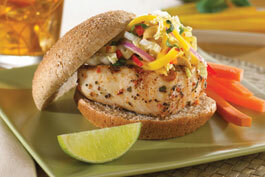 This healthy alternative to a burger features grilled mahi-mahi and a mango slaw made with cabbage, red bell pepper, red onion and honey. 1. For mango slaw: Toss mango, cabbage, red bell pepper and onion in large bowl. 2. In separate bowl, whisk together lime juice, vinegar, honey, oil, salt and red pepper flakes. Pour over slaw and mix well to combine. Marinate under refrigeration at 40 F or below for at least 2 hours prior to service. 3. Just before service, add mint and cashews and toss to combine. Hold refrigerated at 40 F or below. 4. Combine honey and oil. In separate bowl, combine cinnamon and chili. Brush 1/2 tablespoon honey mixture and sprinkle 1/2 teaspoon of cinnamon-chili rub on each piece of fish. 2. On clean, well-oiled charbroiler, place fish, oiled side down, and grill until minimum internal temperature reaches 145 F for 15 seconds. Hold at 140 F or above for service, no longer than 30 minutes. 3. For each order: Toast bun. Place 1 piece of fish on heel of roll and top with 2 ounces mango slaw, finishing with crown of roll. Serve immediately with 1 lime wedge and 4 carrot sticks.